Aiglon College is pleased to announce that the firm of Durisch + Nolli Architetti has been selected to design and deliver Aiglon’s new Assembly & Arts Building. 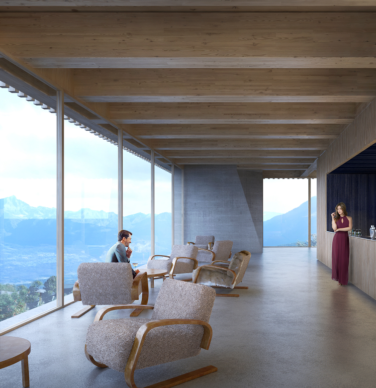 In June 2016 Aiglon College launched a private competition to identify an architectural firm to design and deliver a new Assembly & Arts Building. Five architectural firms from Switzerland, the United Kingdom and Portugal were shortlisted and invited to participate. By November 2016 all firms submitted a design project in accordance with the established brief and competition rules. The Selection Committee (made up of Aiglon leadership and external advisors) submitted these designs to independent experts who reviewed them from the perspective of cost and conformity to local building rules. In addition, key staff users of the future building were consulted and helped to devise a series of interview questions. Camilla Finlay, the School’s architectural consultant commented, “The final submitted projects were all of an extremely high standard, showing in each case a strongly stated core concept that was delivered to a high level of detail and highlighting in each design a unique palette of appealing features.” The Selection Committee was delighted that every one of the projects displayed a level of merit worthy of being taken through to a final design phase. Durisch + Nolli Architetti displayed an excellent ability to understand Aiglon’s desires for its new building and offer a design and vision that fits the School’s needs. The Selection Committee would like to express their delight that Aiglon can now confidently move forward in the next steps of the project’s development.